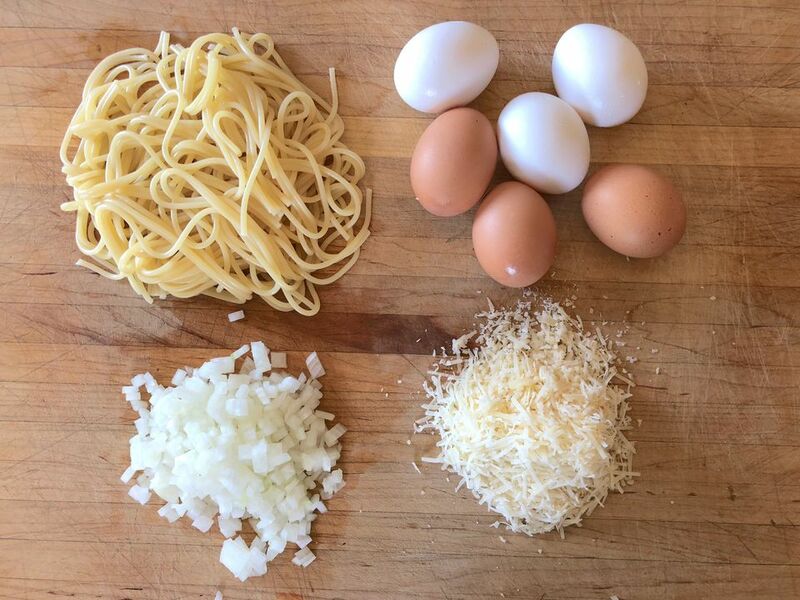 Frittatas are baked open-faced omelets that are a quick and easy way to make use of odd bits of leftovers—including leftover pasta (as shown here) or stale bread. 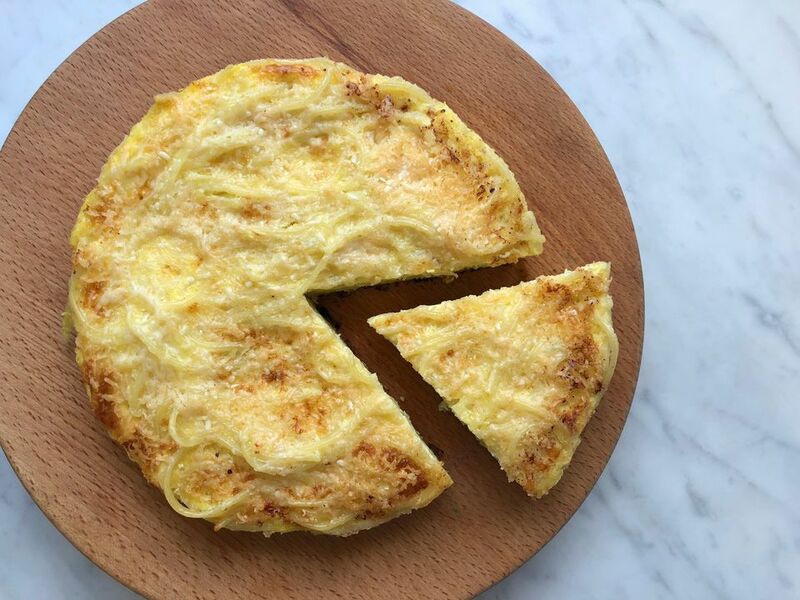 They are easier to master than traditional French omelets and hold quite a bit better, too, making them excellent candidates for brunches and buffets. Frittatas are ready in about 20 minutes, start to finish, so they're a great choice for a quick dinner. They can be baked in the oven, cooked on the stove, or partially cooked on the stovetop and then finished under the broiler. Here we'll cover all three methods. If you plan to bake yours, preheat an oven to 375 F.
Melt about 1 teaspoon butter in an 8-inch frying pan (nonstick will work best, but properly preheated and seasoned cast iron is a solid choice, too) over medium-high heat. When the butter is melted, add the chopped onion and 1/4 teaspoon salt. Cook, stirring now and again, until the onions are soft and translucent, about 5 minutes. Break the eggs into a large bowl. Whisk until utterly smooth—no bits of white or yolk should be visible and when you lift the whisk out of the mixture the eggs should seem almost water-like in their thin consistency. Add the cooked pasta and half of the Parmesan cheese to the eggs, along with 1/4 teaspoon each salt and freshly ground black pepper. Stir to combine. When the onions are done cooking add them to the mixture and stir to combine. Return the pan to the stove over medium heat and melt another 2 teaspoons or so of butter. Once the butter is melted and stopped foaming, pour in the egg mixture. Reduce the heat to low and cook, turning the pan around once in awhile to even out any hot spots the burner may have, until the eggs are set all along the edges and only the top of the center is fluid, about 15 minutes. Sprinkle the mixture with the remaining cheese, transfer the pan to the preheated oven, and bake until the frittata is cooked through and slightly puffy, about 20 minutes. If cooking on the stovetop, wait until the frittata is mostly set before sprinkling on the remaining cheese. You can continue cooking on the stove until the frittata is cooked through (you may want to cover the pan with a lid to help the cheese melt) or turn on the broiler and set the frittata under a hot broiler for a minute or two to brown the top and melt the cheese. Ideally, a baked frittata or even a broiler frittata with puff up a bit in the heat of the oven. If yours doesn't, don't worry, it will still be very tasty. Congratulations! You've successfully made an impressive looking and fabulous tasting frittata with much less effort than your diners will likely guess. Next time, use your imagination and add or subtract ingredients. You could use toasted bread crumbs instead of the pasta, add some bacon or sausage, change the type of cheese, add in a bunch of vegetables in place of all or part of the pasta or do whatever you want. Now that you've mastered a basic pasta frittata, the sky's the limit! Make sure you check out these other frittata recipes, including a zucchini frittata and a leek frittata.